Do you like games? How about friends? What about games with friends? If you said yes to any of those, pull up a chair, because I think you’ll like what I have to tell you. I’m Leah Rivera, your friendly representative of the Guild Content team. My team and I have been working on a system to better support an important part of Guild Wars 2: guilds! So sit back and take a gander at what we have in store for you in February. Besides personal rewards, you will earn Guild Merits by completing missions. 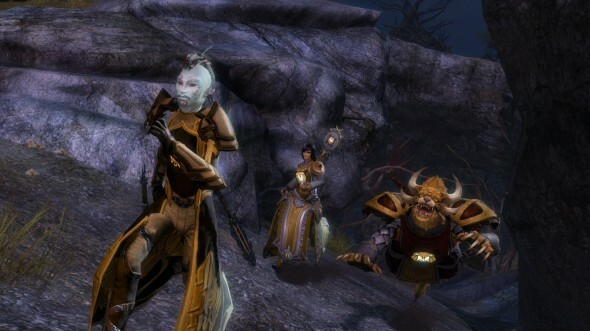 Our team’s primary goal was to create a solid foundation to support PvE guild play. We wanted to create a feature that provided guild members with fun things to do together now, and could be expanded to support new styles of content in the future. To do that, we’ve created a system with three key features: guild missions, guild merits and an expanded unlock system. Guild missions are a new, unlockable, gameplay type that your guild can earn through the guild tech tree. These missions are all aimed at group, coordinated play, so kicking off a mission without anyone around to help you isn’t advisable. “But what if my guild is super small?” you may say? Not to worry—all these missions take place in the persistent world, which gives you the ability to rally people from the surrounding countryside and maybe make some new friends in the process! “Those all sound super fun, but what do I get?” do I hear? Besides personal rewards, you will earn Guild Merits by completing missions. These Merits display your accomplishments in the guild panel and can be used to unlock new guild upgrades. This expanded unlock system will include new rewards like combo banners, gold find bonus, reduced waypoint costs and, of course, the missions themselves. I look forward to hunting bounties and solving puzzles with you all beginning February 26. If you’re game, see you there!